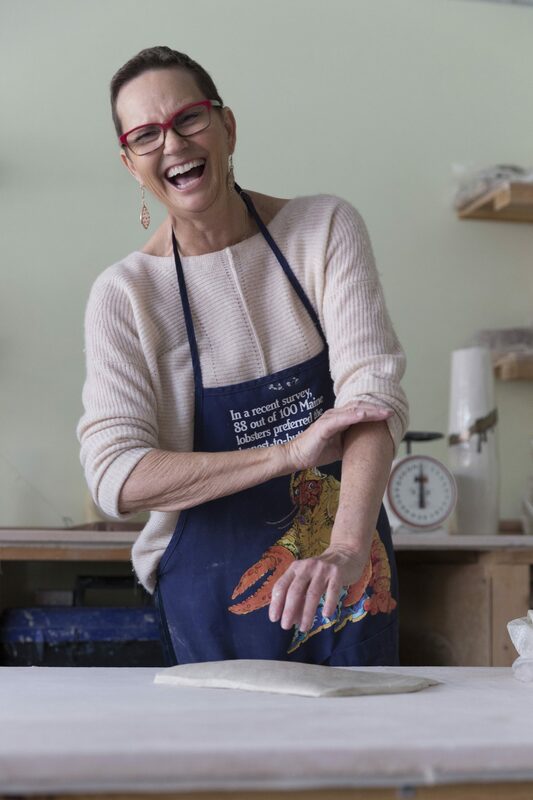 “GIFTING ART” WITH LEIGH GORDON & OUR STUDIO VISIT! PH: Tell us about your medium and what you love most about creating? PH: What is one of the most heartwarming gifts you’ve received? LG: Not to get too heavy… But!… In August 2016, I was diagnosed with a rare form of leukemia and given a shelf life. My doctors and chemo managed to get me into remission, and then the search for a bone marrow donor began. There is an Organization called “Be the Match”, and with a simple cheek swab your DNA is filed away, awaiting it’s perfect transplant patient match… before anyone gets too excited about this… You must be 45 or younger to sign up …Remember! I am but the messenger. In March, 2017 I got the call that a complete and utter stranger was willing to gift me her stem cells. April 25, 2018 I will know her name, rank and serial number, and if she wants to meet, we will do so. I know she is a female, because I now am the proud owner of 3X chromosomes. Also, 45 young friends & family members signed up with “Be The Match” to be bone marrow donors in my honor That, too, was a very cool gift! PH: Do you have a favorite holiday tradition? LG: We moved to Richmond 20 years ago when our girls were in middle school. We started the tradition of dressing up and going to the Jefferson to see the gingerbread house and have dinner. Now, we go with our girls and their husbands. We have 20 years worth of pictures; one UVA graduate posing with his daughters under TJ’s statue, changing to, now, three UVA graduates standing there. When the girls were young, they would pose with the alligator, pretending he had their legs and arms in his mouth, and guess what?!? We have 20 years worth of those pictures as well! Now their husband’s are involved, attempting a rescue. This Christmas we will go to the Jefferson with our eight month old grandson. Who knows what the alligator will do with him! OUR STUDIO VISIT WITH LEIGH! 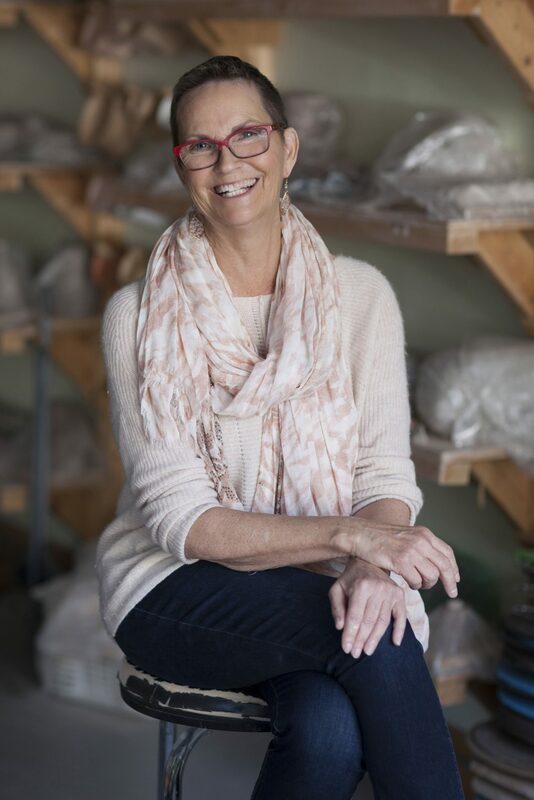 Leigh has been showing her work at Palette Home the last several years and we fall in love with every piece she brings in! Usually the pieces are infused with color; blues and pinks and rich corals, but for the holiday season we were dreaming of white with strands of gold and copper. 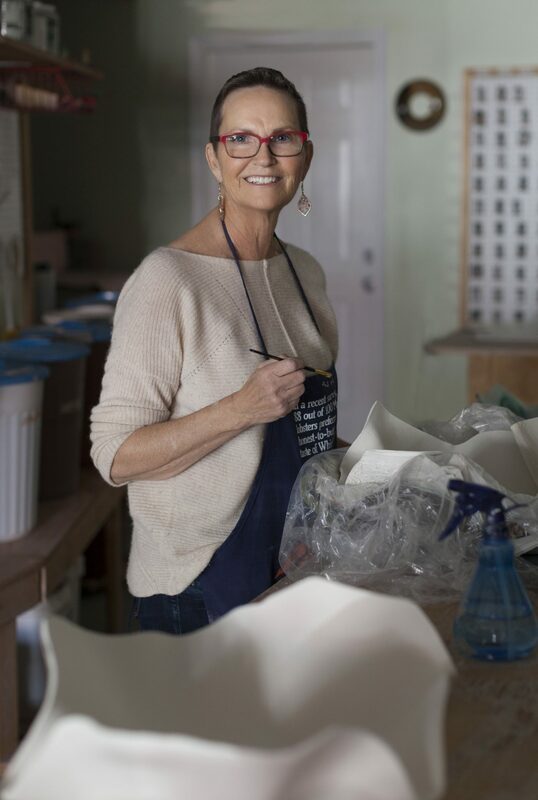 Not only did Leigh love the idea of whites, she invited us to visit her studio at Rosewood Pottery to see just how she creates! 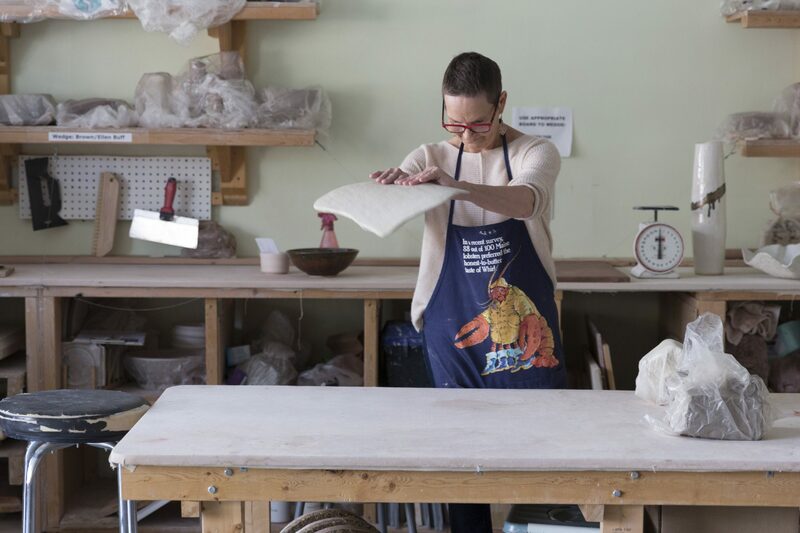 Leigh begins by cutting and weighing a slab of English porcelain clay, enough to build a large bowl. 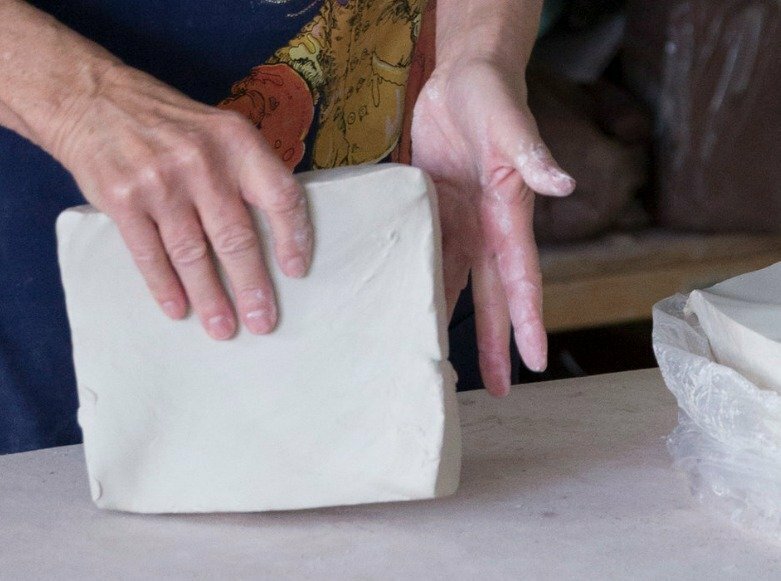 Then she starts “throwing” the clay, throwing the block onto the table over and over, flattening and compressing it to make it stronger. 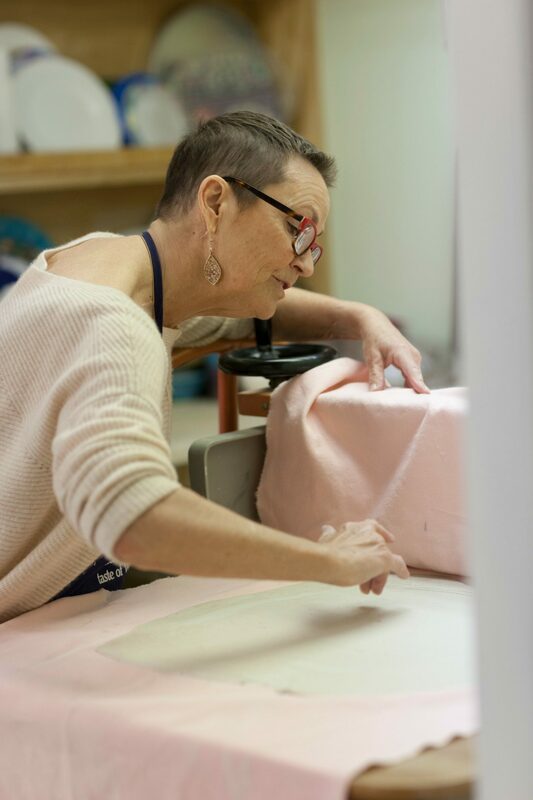 It’s during this process, Leigh says, that each piece begins to find it’s own unique shape. Next, we head over to the big slab roller. Leigh rolls the clay through it several times to make sure the edges are even all the way around and to compress it further, for even more strength. Now it’s time to mold the piece. 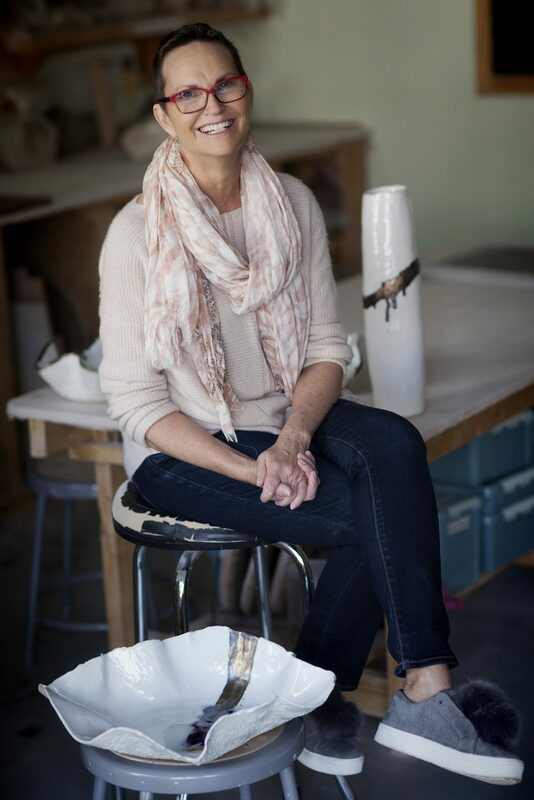 Leigh creates wonderfully organic shapes, she doesn’t strive for perfect forms, instead her pieces are free and loose. When she’s satisfied with the shape, it’s time to wait. It takes weeks for the clay to dry and hopefully has no cracks to mend when the time is up. At this stage of the process, the piece is called “green ware” and it’s ready to be bisque fired. After the first fire, Leigh paints on the glazes (glazes are melted glass particles) that she says come in every color imaginable. The color before it’s fired isn’t the final color; the black on this piece is actually gold. 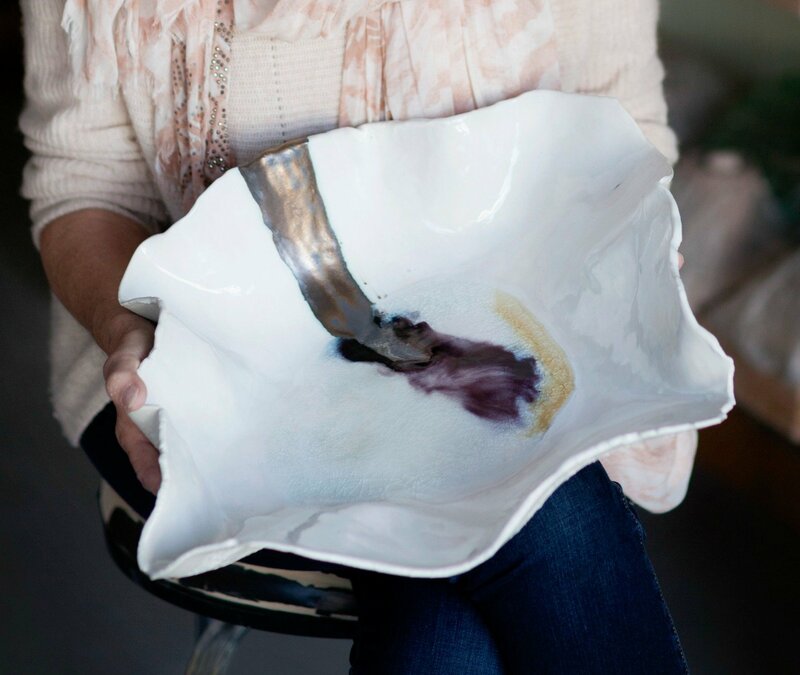 She also likes to drop collected glass pieces into the bottom of the bowl adding another elegant dimension to the piece. Back in the oven it goes to be fired one more time. And then, the big reveal . . . a wonderfully unique and gorgeous work of art! If you would like more information on how to register to be a bone marrow donor visit BE THE MATCH ! Thank you Leigh, for inspiring us with your positive energy, your passion for life and your work! Oh, and your Pom Pom sneakers are the coolest. I have needle pointed and knit most of my life, always being drawn to textured stitches and brilliant colors. My favorite color?…Shiny! As an adult, living in Latin America, my creativity went in a different direction and I wrote. I had a bilingual children’s book published while living in Puerto Rico. Living in Mexico, I learned that orange, pink and red actually do go together! 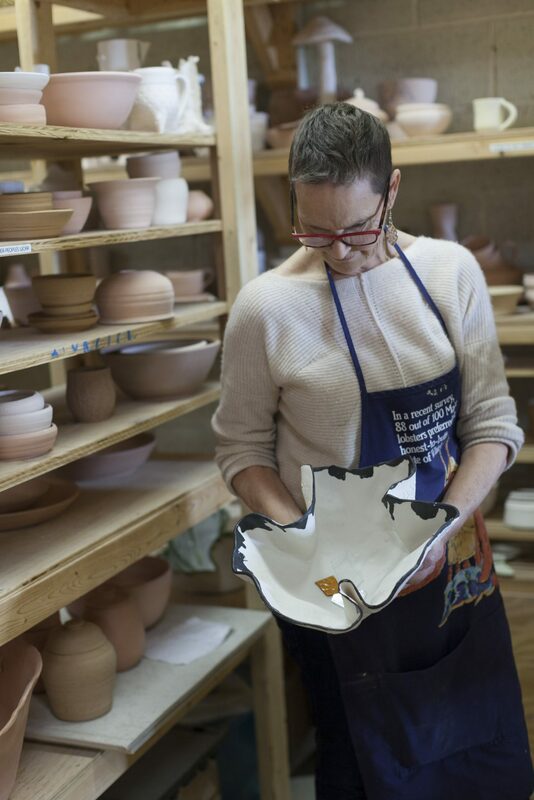 Moving to Richmond, I bounced around at the VMFA studio school taking oil painting and Oil pastel drawing classes, finally settling on pottery 12 years ago. You can find Leigh Gordon’s work at Palette Home in Richmond. We are currently showing more than a dozen LG pieces that are available for purchase. Call or email us to inquire about pricing and photo’s. We ship and insure!